It can hardly be considered as an agate stone because it is actually a colorless chalcedony in which you can find inclusions of green silica, chlorite, magnesium oxide and iron and giving this moss aspect. If you heat the agate, the iron component inside will oxidize and the stone will become red. 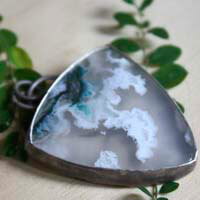 The moss agate (because of its patterns) is more particularly linked to the earth and nature. It was then commonly associated by different cultures to rituals and harvest beliefs. For Greek people, it was good to wear a moss agate to attract favors from the gods. In the Middle-Ages, gardeners would hang one of these stones in their garden to a stick or to a tree to have better harvests. In Arabia, agates were appreciated a lot and were used as eyes in the representation of gods. These stones were also found in the eye sockets of some Egyptian mummies. For the Islam, agates are precious stones. According to the tradition, an agate ring will protect its wearer from prejudices and will give him a long life for example. Indian people from America would give it the power of changing the weather. They would also use it in rituals for the rain to come. This stone is also linked to midwives. 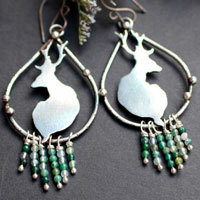 They would traditionally wear a moss agate to give courage to the woman who would give birth and help to reduce pains. It is considered as the most powerful agate. It was often used as an amulet in the past to protect warriors against accidents. 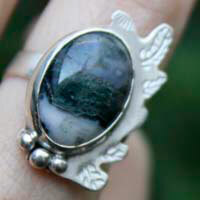 The moss agate has a positive energy because of the inclusions looking like moss from the trees. It is the talisman of the gardener. It would reduce the sensitivity to pollution. The moss agate would awaken joy and sensitivity. It would help to develop a romantic and sexual life. 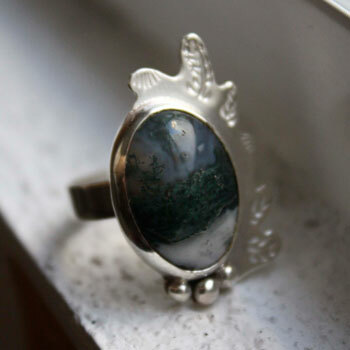 The moss agate would protect against insect bites. It would help to cal intestine, kidneys and respiratory problems. It would regulate heartbeats. It would stimulate digestion by eliminating toxins in the body. The moss agate would attract balance, peace and quietness. It would unite mental and physical energy. It is the symbol of nature. It would help women to give birth with less pain. It would be an anti inflammatory and would more especially help for flues. The moss agate has also the same properties than the agate in general.